Evan an I heard that Heartland Outdoors in Edmond Oklahoma was having Lee and Tiffany Lakosky as guests at the grand opening, we thought that would be a great idea to head over there to meet the very people we watch on the Outdoors Channel and get to know them. 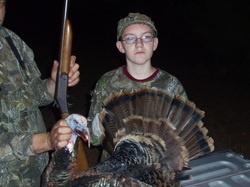 Dad takes son on his first turkey hunt Spring 2011. 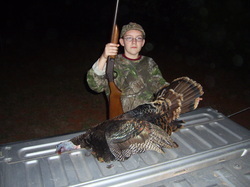 Keith went out Sunday evening on his first turkey hunt with his dad. He explains that his first turkey hunt was exciting because this was his first animal that he has hunted. He says he will be ready for his up coming first deer hunt.